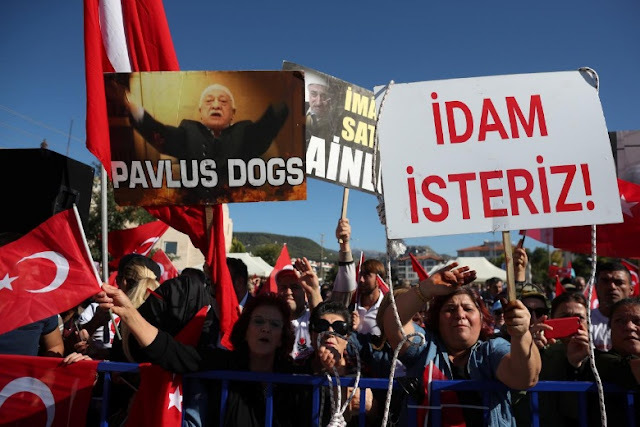 Supporters of President Tayyip Erdogan wave Turkish flags during a trial for soldiers accused of attempting to assassinate the president on the night of the failed last year's July 15 coup, in Mugla, Turkey, October 4, 2017. The placard reads that: "We want execution!". MUGLA, Turkey - A Turkish court on Wednesday found 43 former soldiers guilty of attempting to kill President Tayyip Erdogan during last year’s failed coup, and handed most of them life sentences in the highest profile case related to the attempted putsch so far. Judge Emirsah Bastog read out guilty verdicts for 43 of the 47 defendants, according to a Reuters reporter at the court in Mugla, southwestern Turkey. Mugla is near the luxury resort where Erdogan and his family narrowly escaped a team of rogue soldiers who stormed his hotel during the night of the coup. The trial, which started in February, is part of a sweeping crackdown that followed the July 2016 failed putsch and is the biggest such case to reach a verdict so far. “I hope the verdict today is beneficial to everyone,” Bastog said, as he sentenced 34 of the accused to “aggravated” life sentences, the harshest punishment possible under Turkish law because it lengthens the minimum sentence required for parole. Another seven defendants were given life sentences while two others were given lesser sentences. “(Several) defendants have been found guilty on the charge of attempting to assassinate the president,” Bastog told the packed courtroom. One was acquitted. No verdict was given for the three who were tried in absentia, including U.S.-based Muslim cleric Fethullah Gulen, whom Ankara blames for orchestrating the coup. The court heard final statements from the defendants just before Bastog delivered his verdict. Some of the accused said they did not believe the court could deliver a fair verdict and had been under political pressure. “From the moment I was arrested at the air base on July 16, I was treated like a criminal,” Ergun Sahin, a former air force lieutenant, told the court. Pictures released in the aftermath of the coup showed some suspected coup plotters - including high-ranking military officers - stripped to their underpants, handcuffed and their faces bruised. More than 240 people were killed on the night of July 15 last year, when putschists commandeered tanks, warplanes and helicopters, attacking parliament and attempting to overthrow the government. The government blames the network of Gulen, a former ally of Erdogan. Gulen, who has lived in self-imposed exile in Pennsylvania since 1999, has denied involvement and condemned the coup. A total of 47 defendants were on trial, 43 of whom have been held in detention during the 7-1/2 month hearing. Gulen was being tried in absentia. Most of the defendants were soldiers. A Turkish court on Wednesday found 43 former soldiers guilty of attempting to kill President Tayyip Erdogan during last year’s failed coup, and handed most of them life sentences in the highest profile case related to the attempted putsch so far.